I've made some posts in the past about how more often than not, princesses are portrayed as good and queens as evil. Since this is so often the case, does that mean that the storybook princesses we love are not willing to fulfill their royal destiny as the hope for their kingdom's future? While it's true that princesses often seek freedom from the confines of palace life, they don't necessarily want to run away from their responsibilities either. The problem is that princess stories usually reveal only a brief period from their heroine's life that takes place before the biggest trials and tribulations of reaching full adulthood. I expanded upon this briefly in my "Confessions of a Grown-Up Princess Fan" post, where I discussed how even though I still relate to certain aspects of being a princess, I have developed a sense of cynicism that I did not have the first time I watched their movies. Seeing the world through the eyes of a princess now feels more like a nostalgic trip down memory lane than seeing myself reflected in them. Stories about queens, such as Reign, are generally intended for older audiences than stories about princesses. That isn't necessarily because the protagonists are older either. After all, Mary, Queen of Scots was still a teenager when she was crowned. It's also not about the ability to be a leader since we all know there are plenty of princesses who can do that just fine as well. No, the reason we don't see princesses become queens in fairy tales is something deeper. It's because becoming queen inherently forces a princess to lose her innocence and curiosity about the world, which have become defining traits for the Disney Princess genre. 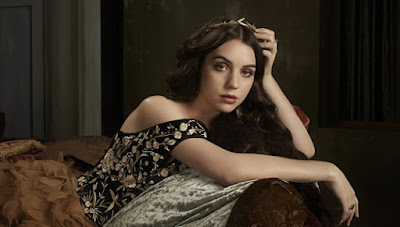 A queen must be exposed to some of the darker sides of being royal, such as warfare, political alliances, manipulation, and the suffering of peasants. Carefree teenagers who dance in the woods with their animal friends don't see these things and maintain a beautiful air of purity and optimism about the world around them as a result. If their stories end before they reach that point in their lives, that purity remains an immortal part of their identity that defines what people remember most about their stories for many generations. Over the weekend, I had the pleasure of attending an exclusive presentation by Stacey Simmons about the theory of the Divided Woman, in which women are split between two forces--the innocent princess-like side that uses the magic of love to solve all of her problems and the empowered witch-like side who has been scorned in some way and must use her unique talents to overcome adversity. The only way to overcome this struggle is by accepting both sides of herself to become a United Sovereign Queen. As an example of this, Stacey referenced how Moana used the heart of Te Fiti to unite Te Fiti and Te Ka. There is certainly no shortage of princess movies these days, but there is a decline in the feminity of their heroines in comparison to the princesses of the past. Clara from The Nutcracker and the Four Realms trailers does indeed appear gentle and feminine in her elegant mauve dress, but she is also portrayed wearing a soldier's uniform and propositioned to fight Mother Ginger and save the Fourth Realm. Even the upcoming princess scene from Ralph Breaks the Internet is centered around showing us that our favorite princesses are not always perfectly dressed and well-mannered. I don't think Moana is the only Disney Princess who was able to unite the two sides of her personality and achieve sovereignty. Tiana from The Princess and the Frog, starts out as an empowered fearless entrepreneur and learns later to accept the gentler side of herself upon realizing that she is in love with Naveen. She teaches him the meaning of responsibility just as much as he teaches her the meaning of love. The pilot episode of Sofia the First called "Just One of the Princes" demonstrated that Sofia did not want to be a traditional feminine princess who was obsessed with jewels and gowns by surprising all of the students of Royal Prep when she signed up for a class that only princes took to learn how to ride a flying horse. She achieved sovereignty by dressing up in many lovely gowns and being adorable while also using the powers of her amulet to save others instead of needing to be rescued. Elena of Avalor might be the first Disney Princess to express a genuine desire to become queen but must rule as crown princess instead until she comes of age. She demonstrates her feminine side by ruling Avalor with understanding and diplomacy while maintaining her empowered side by unapologetically taking the initiative in any task even if it means being a little reckless and learning to use the powers of the Sceptor of Light against Shuriki. It took many years for princess mythology to reach a point where the heroines would no longer need to be divided between their two selves. In earlier stories such as "Snow White" or "Cinderella," portraying the titular characters as queens would take away an inherent part of who they are and what people love about them, namely their innocence and optimism about the unlimited potential of a world that they have yet to experience. In more recent adaptations, such as Disney's The Little Mermaid, it was possible to portray Ariel as queen in the sequel somewhat believably because she was less submissive than her predecessors and had the courage to break the boundaries that her father set for her, placing her on her first step in the path to sovereignty. I don't believe that storybook princesses are necessarily afraid of becoming queen, but most of them are not yet at a point in their lives where they would be able to comprehend such a mysterious and potentially dangerous future. That limitless potential is one of the things that makes their stories so fascinating.